Clarets boss Sean Dyche admits his squad need the boost of some fresh faces in the January transfer window. Speaking ahead of yesterday’s visit of Bristol City to Turf Moor, Dyche feels a tricky run of results has underlined some areas he would like to enhance as Burnley go into the second half of the season. Boxing Day’s 3-0 loss at Hull City was a third defeat in five games, and although the Clarets remained fifth in the table before the return of former boss Steve Cotterill yesterday, there is room for improvement. Asked if the current run of form had altered his thinking as to what he needs in the window, Dyche replied: “Not so much recent form, there are certainly two, maybe three targets we have been on with for a while. “Recent form highlights a couple of things, I think, to the challenge we have going forward, but there are a couple of things we have been on with for a while and we’ll see if they develop. We do need to do that to give us that step forward. “Finance needs to be spent, and we’ll see where we can take that. It’s another important part of it. Dyche explained in Express Sport on Christmas Eve that he has funds: “I make it clear to everyone, there is money available. “It’s not a bottomless pit, wages are still a challenge, when you talk about your real big market players that is, so we still have to careful with that one. 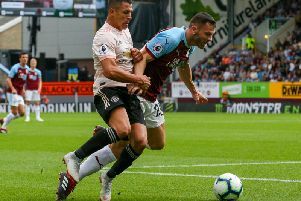 Going forward, Burnley host Ipswich Town, sixth at the time of going to press, before three away games in six days, and Dyche said: “I said to the lads, not that they don’t know it, every game gets more important. We’ve had a tough run of away games, we’ve just played four of the top six. “There’s only Brighton we haven’t played away, so that has to go into the balance of what we are trying to achieve. “They all have to come back to Turf. But you have to take points wherever you can get them, and we’ve generally, for a long period, done well away from home. We have to do better because over a season you will need those points.